​​​TEXAS – Apartment developers are building new properties at a faster pace than at any time over the past two decades. 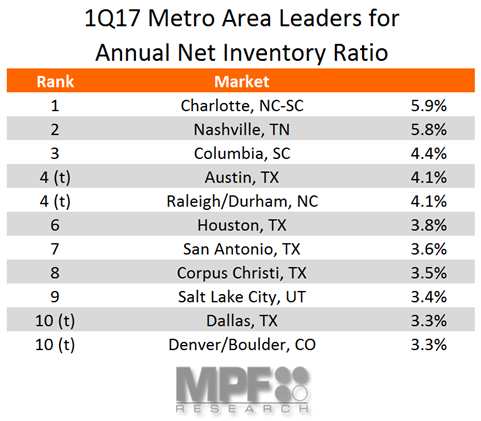 Many of the top markets for inventory growth hailed from Texas. Robust growth was seen in Austin (4.1 percent), Houston (3.8 percent), San Antonio (3.6 percent), Corpus Christi (3.5 percent) and Dallas (3.3 percent). In general, site availability and lower barriers to entry in Texas are attractive to developers seeking to tap pent-up apartment demand generated by the state’s strong economy and favorable demographic profile. Not surprisingly, many of the nation’s inventory growth leaders over the past year maintain aggressive construction pipelines. Dallas upheld these trends. Fueled by strong demand drivers, the market has long been a development frontrunner—and planned supply shows no signs of slowing. In the latest U.S. Census data, Dallas-​Fort Worth registered a 95.8 percent year-over-year increase in year-to-date multifamily permit volumes. ​Want more da​ta? See Multifamily Market Research for DFW, Austin, Houston, and San Antonio.